Since 2014, we have been producing a cardboard-based virtual reality viewer for our clients. However, there was always one problem: A bulky design. This leads to other problems: (1) Difficulty in shipping and distributing in large numbers. For example, if you need to distribute large numbers of the viewers in an exhibition or in an event, this could be an unnecessary struggle; (2) It could take so much spaces in the inventory, which is not so eco-friendly; (3) It needs to be assembled, which could waste so much time for the clients if they order it in large numbers. We took a look at this problem, learned it, and found a way, which later leads to a perfect solution regarding the bulky design. So, the first solution we solved was providing an assembled virtual reality viewer, served in a box with a customized packaging. This solution gives an effortless access to the clients and end-users. Moreover, it gives more flexibility in branding customization through its packaging. We executed this solution for one of our clients, Effat University. This virtual reality viewer is used as a souvenir, so the visitors could revisit the Effat University (specifically, the Virtual Reality Research Center) from home. With the help of our team at Visual Experience and BeThere, we also developed and produced the content. Still, this solution hadn’t solved the other problems. So, we went back to the root of the problems: The bulky design. Therefore, we took more time to research. 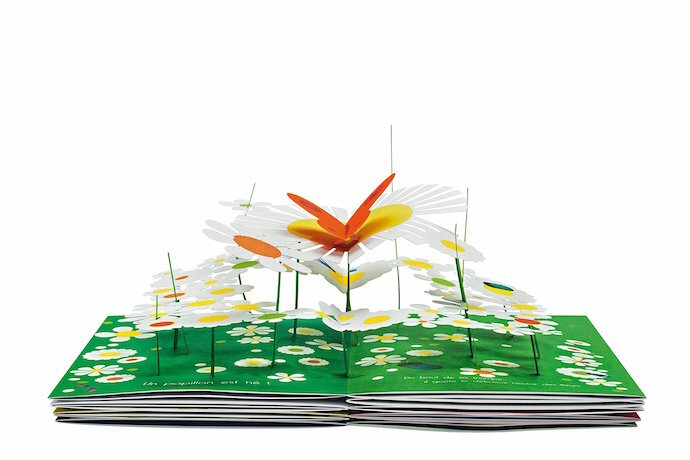 During our research, we thought about a 3D paper pop-up, like the one on a book for kids. Something like this. So, why didn’t we use this method to solve the bulky design in a virtual reality viewer? We collected more examples of 3D paper pop-up works, adjusted the virtual reality viewer into a foldable 3D paper pop-up, did our first prototype, and this is how it became. We never thought that a no-bulky design could make a virtual reality viewer works more versatile. First, we could add more pages, something that has never been approached by any kind of virtual reality viewer. By adding more pages, it allows the possibility of collaborating a catalog or a book with virtual reality. Second, the space around the viewer could be used to put some information related to your business if you want to use it as a brochure. Third, it gives us more flexibility in branding customization. Take a look at this. The existing of BeThere Book—that’s how we called our no-bulky virtual reality viewer—is now sold in four editions: Travel Edition, Learning Edition, Sporting Edition, and Gaming Edition. Each edition provides a list of recommended virtual reality content related to its edition through QR codes. The no-bulky design and how foldable it is makes BeThere Book accessible in any kind of place. For instance, BeThere Book: Learning Edition works perfectly in any kind of classroom, as it looks like a book and already provides the educational content inside. BeThere Book: Travel Edition works perfectly as a promotion tool in traveling, which will boost more sales and leads to a satisfying holiday. Furthermore, BeThere Book can be customized according to your brand and business. For now, BeThere Book is already a global patent-pending product. We will keep innovating VR headset in any kind of material. Different material; different execution, and we’re working on it. We believe this is one of the ways to bring virtual reality to the masses. And, we’re glad we’re a part of it. Now, the question is: Is this going to be the evolution of VR headset? Well, it could be, but we will never stop innovating. Subscribe us for more interesting news from our lab! Follow our social media: Facebook, Twitter, Instagram. Anyway, BeThere Book is now available for FREE SHIPPING. Buy it today.